For whatever reason, I became recently obsessed with purchasing a tart pan. So $10 and 5 hours later (thanks to Amazon Prime same-day shipping), I had my tart pan. Yes, I admit I’m an impulse buyer and I should probably exercise more care in purchases, but what’s done is done! Now the big question was what to do now that the tart pan was in my possession? Ideas were brewing. Another chocolate tart? Nah. Fruit tart? Hm… perhaps, but maybe I’ve been overdoing it on the dessert front. More thought. 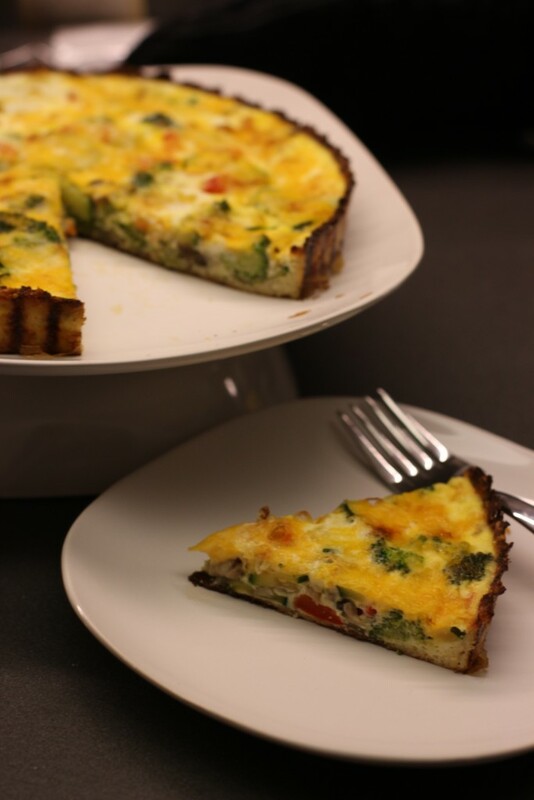 Oh, ding-ding-ding: cauliflower crust quiche! My childhood memory of quiche has always been those of mini frozen Costco variety that was served as an hors d’oeuvre at fancy gatherings. Tasty, but not exactly the healthiest. 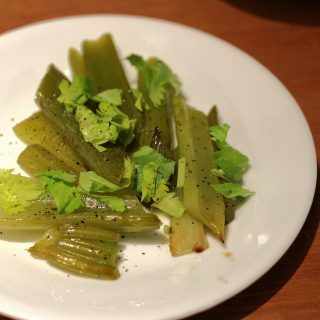 With my currently injured ankle and my transitively not-so-active lifestyle, I was absolutely determined to find a figure-friendly recipe that didn’t sacrifice taste. 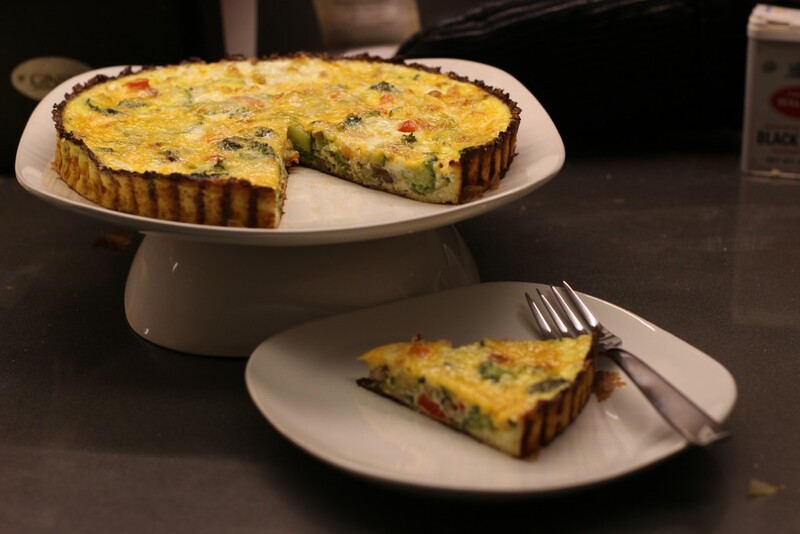 I’ve always liked myself a good egg white omelet, and a bit of googling brought me to sally’s baking addiction‘s crustless, egg white-rich quiche recipe which looked delicious but was missing a key quiche feature I couldn’t sacrifice: CRUST! The tender, flaky, pastry crust of traditional quiche has got to be the dish’s highlight for any carboholic such as myself. Unfortunately, crust isn’t exactly the most nutritious part of the quiche either. I remembered hearing about the “cauliflower pizza crust” that had become all the rage in recent years and I thought… if it works for pizza, maybe it’ll work for quiche! 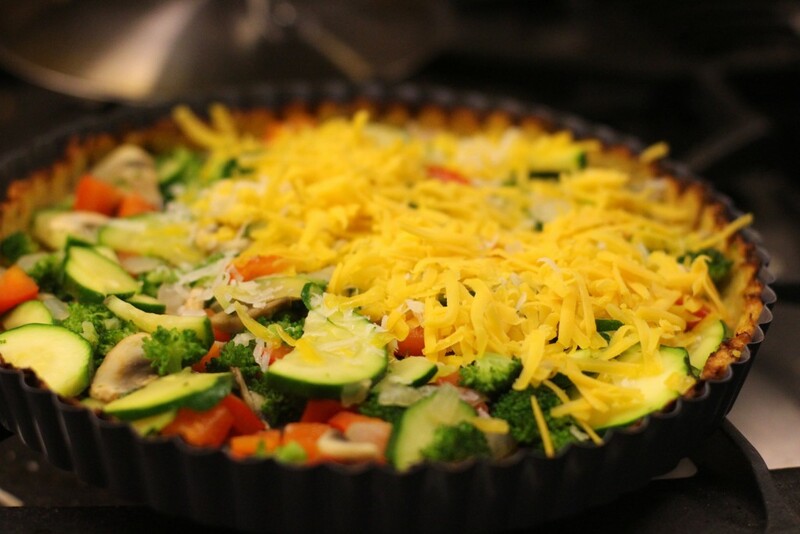 And that’s how this flourless quiche packed with colorful veggies came to be. Wow was it delicious! No cream, no butter, no flour… Packed with vegetables through and through, with its natural flavors brought to life through a quick sauté, and then lightly smothered (two words I wouldn’t normally put together) with freshly grated cheddar and parmesan cheeses. Yes, please! What’s better is that I had no qualms with helping myself to a second serving of this delicious bad boy. 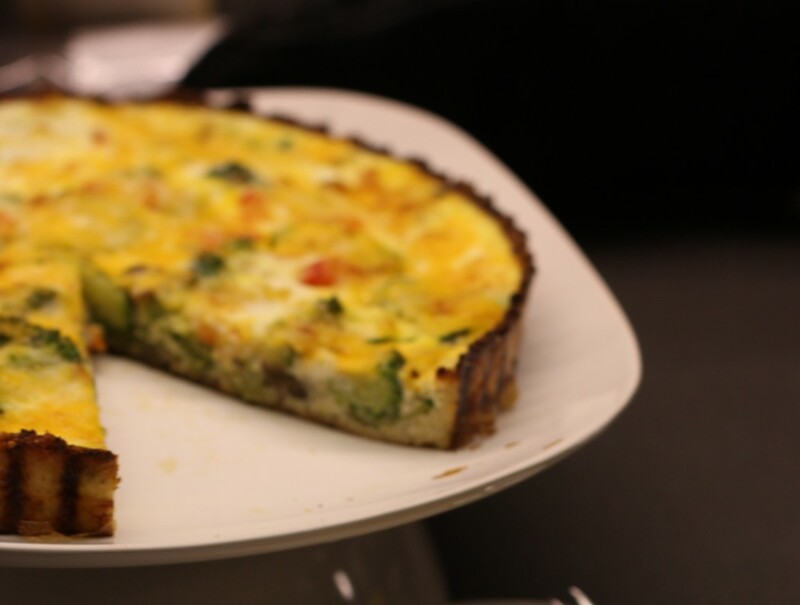 Though not as creamy as its original, this healthy quiche was delightfully light, bright, and definitively satisfying. A light and healthy yet hearty quiche packed with bright and flavorful veggies and a flourless cauliflower crust! This low fat, protein-rich dish is both taste and waist-friendly! Chop cauliflower into small florets. Pulse in food processor until grain-like, should yield 3-4 c.
Microwave cauliflower grains for 5 minutes. Cool for 10 minutes, then use a cheesecloth to wring out excess water. This step is crucial as excess water will create a mushy crust, and we don't want any of that! 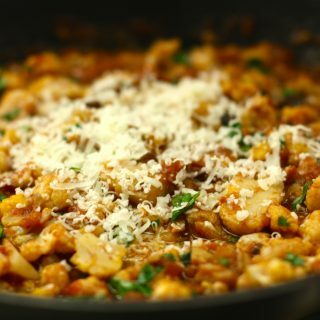 Combine dry cauliflower grains with grated parmesan, egg, and seasoning until well mixed. Press crust mixture into tart pan and push up the sides about 1-inch all the way around. Try to maintain consistent thickness throughout to ensure that the crust bakes evenly. Bake for 12-17 minutes at 425 F or until golden brown throughout. 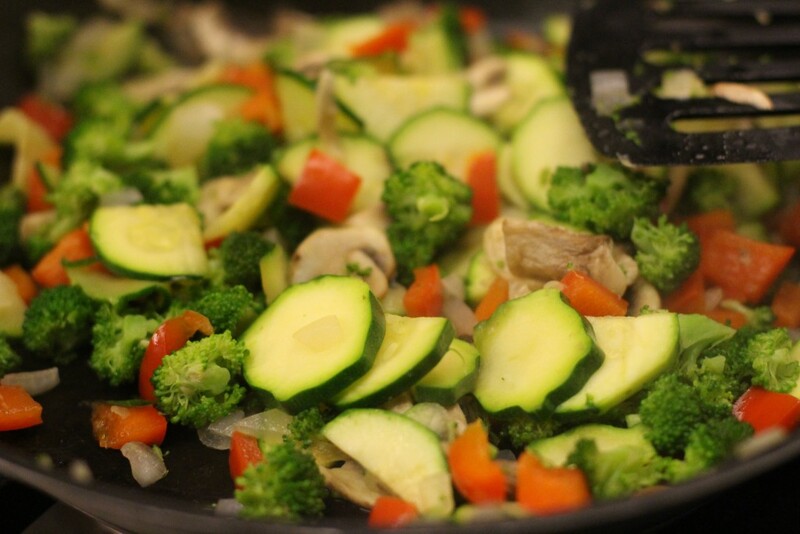 While crust is baking, saute quiche veggies in a pan until softened. Whisk together 3 eggs + 3 egg whites (that's a total of 3 yolk, 6 whites) with skim milk. 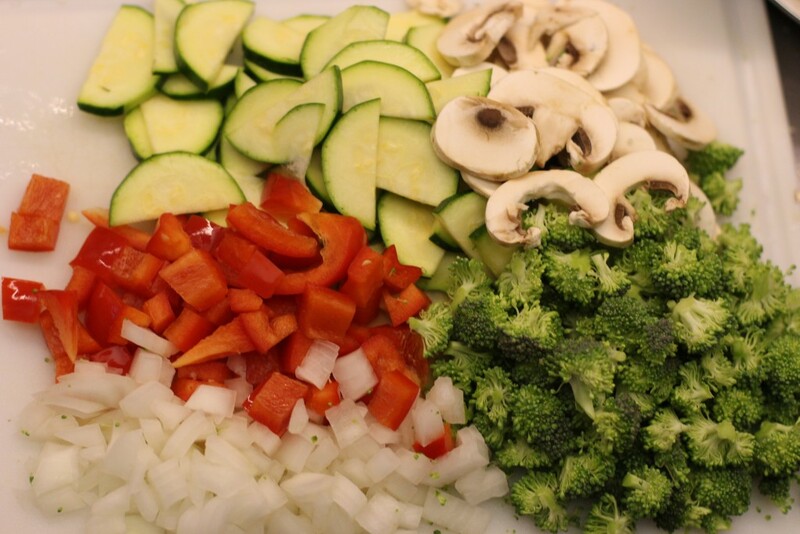 Fill prepared crust with sauteed veggies. Cover with shredded cheddar cheese. Pour egg mixture to fill quiche. Sprinkle grated parmesan over top. Bake for 45 minutes at 350 F. Quiche should be set and eggs thoroughly cooked. 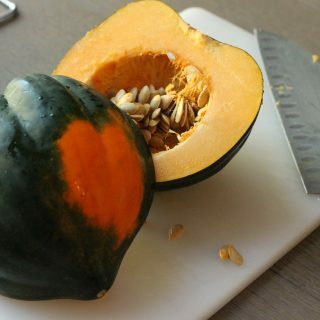 Remove from tart pan, cut into 6 slices. Serve and enjoy! PS: If you haven’t already, find and follow me on bloglovin’! bloglovin’ is a great way to get a consolidated “smart feed” of all the blogs you know and love, and it’s also an outlet for finding new ones to enjoy! Oh yumm! I want to try this right now! Looks amazing!!! You are such a good chef lady!!! Let me know how it goes! The crust was a bit tedious to prepare, but the end result was so good! :) I think this GF version is just as tasty as the original. What diameter is your tart pan? Hi Pete– the tart pan that I use is a 9-inch bottom-release pan. Just wondering if this can be made the day before and reheated in the oven? 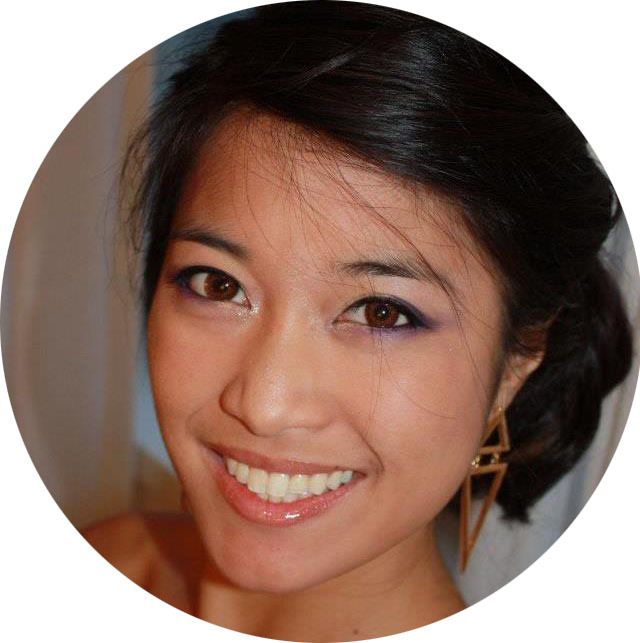 Hi Heide– it absolutely can. I had leftovers and heated slices in the oven the day or two after! I’d still recommend making day of for best results but reheating in the oven (not microwave oven) should be no problem. Seriously one of the best quiches I’ve ever made. I meant to make it in food prepping but keeping eating it for dinner, too! Love it! Hi, I’m a bit confused about how much of the egg goes in the crust and how much gets mixed in the filling. Could you please clarify? This looks so amazing! I cannot wait to try it! Hi there! I use large size eggs for all my recipes. You’ll want to use 1 full egg for the crust. The filling includes 3 full eggs plus extra egg whites from 3 additional eggs. To put it another way, you’ll need a total of 7 large eggs. 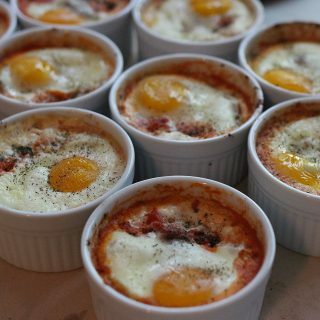 Crust requires 1 full egg (~50g). Filling calls for egg whites from 6 eggs (~180g) and the egg yolks from 3 eggs (~60g). You’ll have 3 yolks left over. Hope this helps and would love to hear what you think! So good looking! What’s the approximate amount of calories per serving? Can I substitute the skim milk for almond milk or heavy whipping cream to make it more keto friendly? Hi Edie! Yes, you should be able to sub the skim milk for any type of milk.